Running an Instagram account that is a mix of personal and business leads you to a choice, and it’s one that we have been discussing for a few months now. 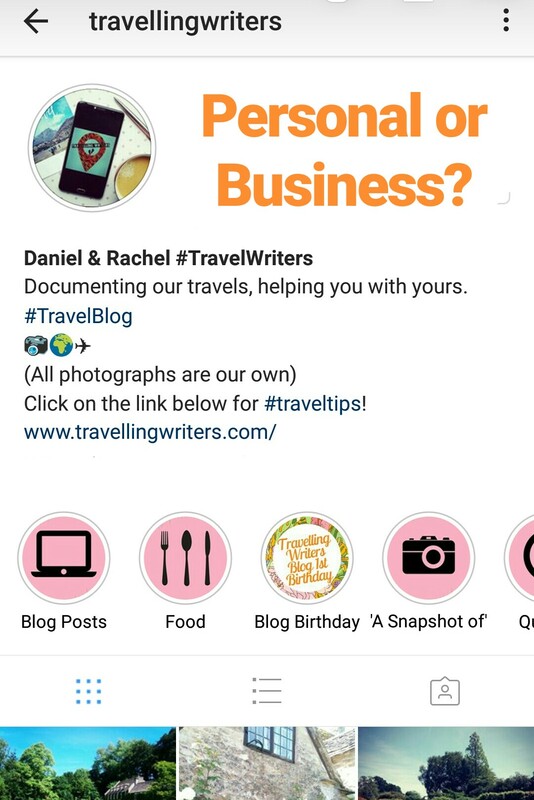 Which style of account should we have on Instagram, personal or business? For a long time we were business. Both are free, and business offer some statistics that personal pages don’t. These are stats such as knowing how many people have visited your page this week (a number which wildly fluctuated day by day), the percentage of people your photographs were reaching (including the split between hashtags, page visits etc), and the opportunity to sponsor a post to reach more people (a paid option). To be honest, after ‘going business’, I felt that our engagement dropped. We were also being followed by accounts that were definitely bots much more, and I found the constant reminder of page visits stressful to say the least. It made our Instagram page go from something that I loved sharing our adventures on, to something that felt like an obligation. This is something I never want for Travelling Writers, a page that was grown out of love. I made the decision to switch back to personal without consulting Daniel (woops! ), and decided that we would try it for a week only. Well, that was a while ago now, and it has stuck. I have noticed an decrease in bots following us, and increase in genuine travel accounts that I am excited to engage with, and the engagement with our page feels as though it has remained the same. No, we no longer have the opportunity to sponsor posts, but our page has gone from work to fun again – and that, for us, is the most important thing. So, if you are unsure about the right choice for you, swap for a week. See what happens. You can always go back!